Mike McEachern happened upon Bill Halliday’s book entitled Adventure is Underground and, in due course, was invited on a grotto trip with Ray Beach and Dave McClurg. He transferred his college major from electronics to anthropology and, ultimately, did a master’s thesis on the mortuary caves of the Mother Lode region. Offered a research assistant position in archaeology at the University of Alberta in Edmonton, McEachern moved to Canada to search for signs of early man in the caves of the Canadian Rockies. Mike was conducting excavations in the Crowsnest Pass region during the same time that Derek Ford and his colleagues were searching for caves in that area. 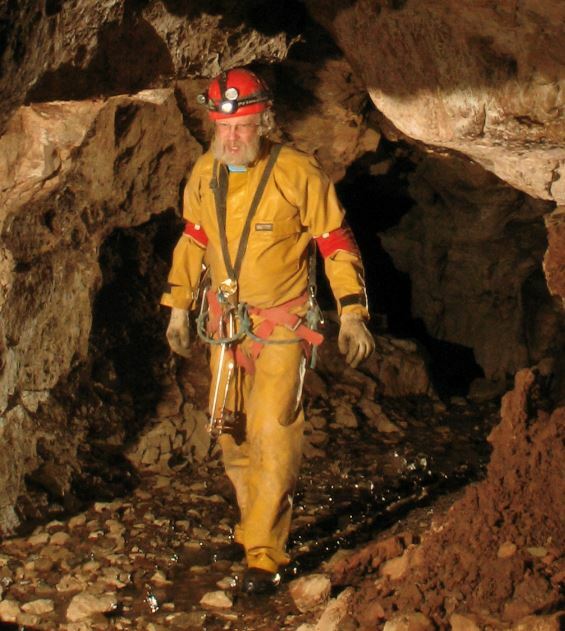 As a result, Mike ended up on the first trip to the Andy Good Plateau, when both Yorkshire Pot and Mendips Cave were discovered. Leaving Canada and moving back to California, McEachern planned a short reconnaissance trip into the Bob Marshall Wilderness, where a small cave had been found the previous summer. This trip resulted in the discovery of the Silvertip System. Mike was heavily involved with the initial work at Silvertip, including the recruitment of other strong cavers to assist with the project. Along the way, McEachern discovered the entrance to Getout Cave on this mountain. Getout was soon connected into the main complex, resulting in a cave that was over 1,000 feet deep. One of Mike’s major interests in the sport involves cave photography and, in particular, stereo cave photography. Beginning with a basic Stereo Realist camera, Mike expanded to the ownership of about a dozen stereo cameras. One of his stereo photography projects involved providing the imagery populating the three-reel View-Master set that features the justly famous Caverns of Sonora.